The Congress's complaint came soon after the EC issued a show cause notice to Rahul Gandhi for violating the model code by giving interviews to Gujarati TV channels. NEW DELHI: The Congress today petitioned the Election Commission for action against Prime Minister Narendra Modi for addressing an event organised by an industry body on the eve of the final phase of the Gujarat polls where he attacked the main opposition party. The Congress's complaint came soon after the EC issued a show cause notice to Rahul Gandhi for prima facie violating the model code by giving interviews to Gujarati TV channels, and asked him to reply by December 18, failing which it will decide the matter without any reference to him. A delegation of Congress leaders comprising Ashok Gehlot, Anand Sharma and Randeep Surjewala handed over a memorandum to the poll body, demanding strong action against Modi and other BJP leaders for addressing press conferences and events on the eve of last phase of polling in Gujarat. "We are going to the Election Commission with a memorandum demanding action against Prime Minister Narendra Modi, BJP chief Amit Shah, Union ministers Arun Jaitley and Piyush Goyal and others for violating the model code," Anand Sharma told reporters before meeting the poll panel. He said the EC should remain non-partisan. Earlier in the day, Modi launched a blistering attack on the Congress, saying that banks were pressured under its rule to give loans worth thousands of crore to select industrialists and termed it as the UPA government's biggest scam. A day before his home state Gujarat goes to the final phase of polling, Modi attacked "economists" in the UPA for handing him a "liability" of non-performing assets (NPAs) or bad loans, while hard-selling his central government's pro- poor schemes. Surjewala said the EC today acted against news channels for airing the interview of Rahul Gandhi which was against the freedom of expression guaranteed by the Constitution. The Congress memorandum said: "The Election Commission is duty bound to be fair and impartial. We have to regrettably state the apparent discrimination and an apparent advantage being given to the ruling party miltates against this notion." It also requested the poll body to immediately withdraw its order directing registration of an FIR against news channels for telecasting the interview of Gandhi. 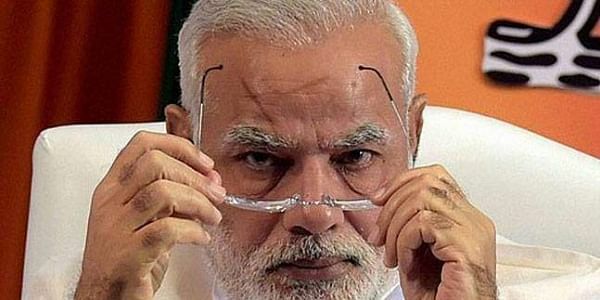 "In case the yardstick of violation of model code of conduct is to be applied as is being done by EC order, register an FIR against prime minister Narendra Modi, BJP chief Amit Shah, Finance Minister Arun Jaitley, Union minister Pyush Goyal, BJP state president Jeetu Vaghani and other BJP leaders for flouting the model code of conduct," the memorandum said. It also demanded that EC give directions to all print and electronic media outlets not to carry any news item with regard to elections and not to live telecast pictures of leaders casting votes. Surjewala alleged the EC order is an attempt to "suppress the media", and claimed the BJP was exerting pressure on the poll panel for it. He said Modi had given interviews ahead of 2014 general elections but no case was registered then. "These double standards will not be allowed," he said.